Adidas is doing their part to improve their manufacturing methods to a cleaner, less waste and promote ethical sourcing. One of the first things the company has done is to help save the ocean by partnering with Parlay for the Oceans. The idea is to help keep plastic out of the oceans by recycling and transforming it into new shoes and sportswear. For 2018, the partnership has helped the company launch a new line of products that are all made from recyclable ocean plastic. 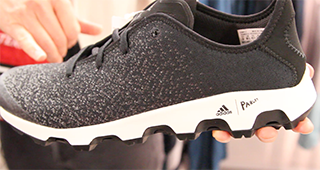 One example is Adidas’ expanded footwear collection that includes shoes that are knitted using recycled plastic thread. Now, these shoes aren’t something your grandmother crocheted together. The process knits the fibers together to form the shape o the shoe. In addition, the knitting process doesn’t produce any waste, further helping Adidas to promote more “green” manufacturing. Aside from the company’s Parlay for the Oceans program, it is also incorporating a better cotton initiative. They expanded the footwear collection that is knitted together into the shape of the shoes, and in which the manufacturing process doesn’t produce any waste. By 2018 Adidas is also incorporating the better cotton initiative. According to Angie Matthews at Adidas Outdoor, the company is also looking to source ethically sourced cotton to all of its sportswear line of shirts, and by 2018, the company will be ethically sourcing all of its cotton shirts an apparel made from this material.